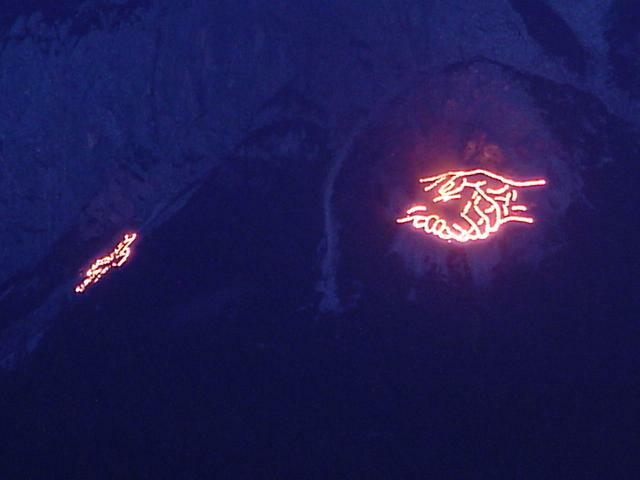 This year, the "two sides of the mountain" are celebrating Johannisfeuer on two separate nights. Last night, we went with some friends (who had a car) over to Austria in the area immediately behind (for us) the Zugspitze. The various Vereins climb up on the rock faces of the various mountains and place smudge pots in the form of various designs. When darkness falls, they light the pots and literally 20 to 30 intricate designs come to life. 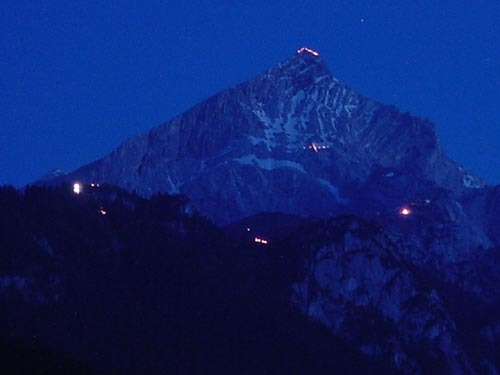 I took a couple of time exposures of the scene on the north side of Lermoos, looking south and east. As you can see, the moon also made an appearance. The actual view was a lot darker than the time exposures show, but the pictures give an interesting effect. 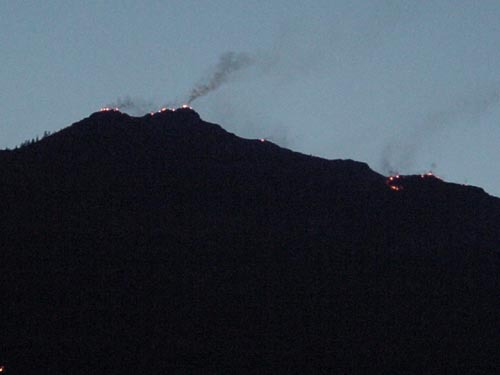 In some directions, entire ridge lines were traced out. There were probably at least 1000+ vehicles pulled over, with people darting out from between them (shudder). We drove around after I took the pictures and looked at some of the other designs (horses, beavers [for the town of Bieberwier], and some other animals and slogans). This year's theme seemed to be on peace and friendship. 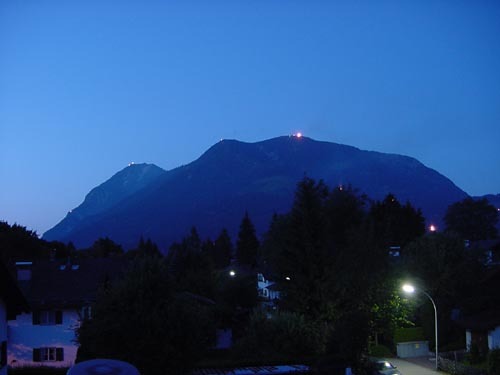 I am retired and live with my wife in Garmisch-Partenkirchen, Germany. On the night of June 23rd, last, the annual Johannisfeuer celebrations took place and I took several digital photos out of the skylights of the apartment where we live. 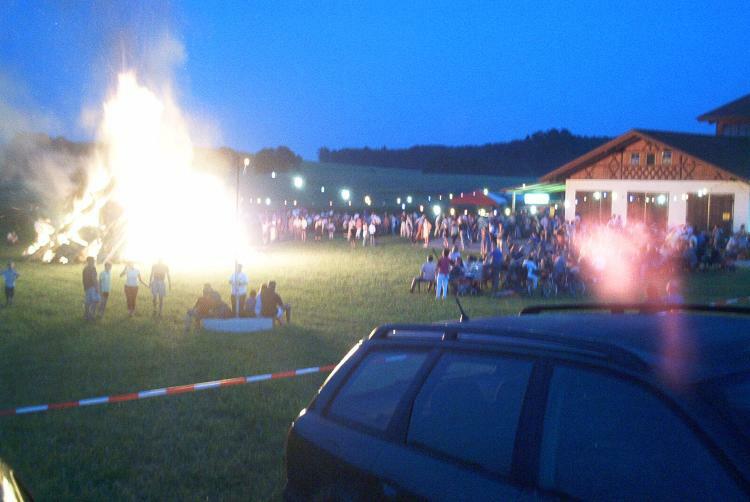 This morning I got an email from my wife (visiting in the US) in which she asked me to ask a couple of the neighbor ladies what the custom of Johannisfeuer was, as several of her brother's neighbors were interested in the origin of the celebration. It was after about a half hour of internet searching and reading, trying various combinations of search keys, that I hit upon your site at. And there was the best explanation I could ever hope to find! I sent her the link (as well as the text). So, in appreciation for all the work you have obviously done on the site, I'm sending you copies of the pictures I sent to my wife and brother-in-law. 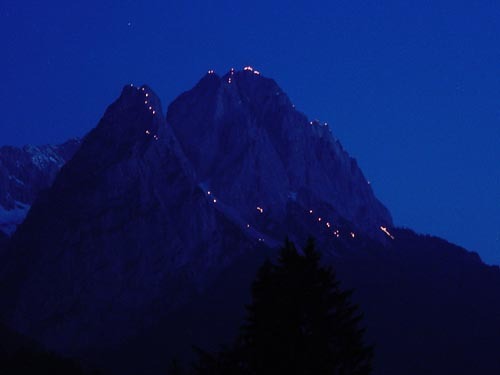 They are of last Saturday night's (June 23, 2001) Johannisfeuer celebration around Garmisch-Partenkirchen and show the fires on the mountain peaks listed at the top of each photo. We can't see the Zugspitze from our apartment because the Waxenstein is in the way. As you probably know, there is no way to effectively capture the total feeling one gets from observing this 360-degree celebration. 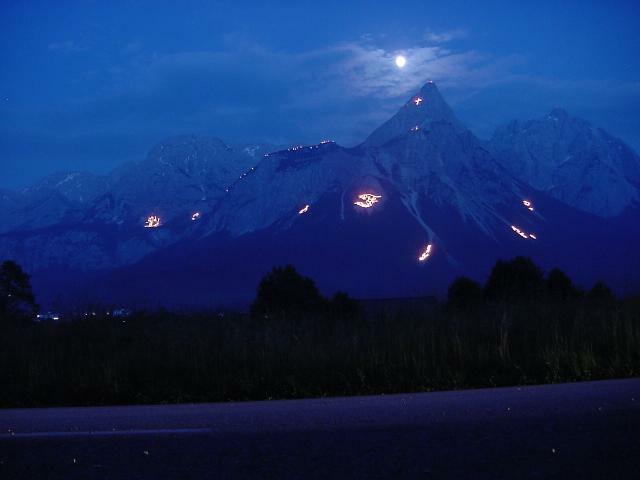 Seeing the 50 or 60 individual fires, all burning simultaneously as twilight fades and realizing that each one of them is burning because someone is up there tending it, simply staggers the imagination. Feel free to use the attached digital photos in any way you choose. Link them to your website as I'm sure others would like to see them also. As they say, a picture is worth a thousand words. Anyway, enjoy!